Cary, NC – One of the greatest things about Cary, and most surprising to me when I moved here from Southern California 10 years ago, is the prevalence of ethnic cuisine. When I arrived in NC, I was under the mistaken presumption that I would be awash in burger franchises, fried chicken done 1,000 different ways and maybe some chain pizza. To my delight, I discovered East Chatham not long after we arrived. A true Mecca in the heart of Cary for the more adventuresome diner, with offerings from China, Japan, Nepal, Latin America, the Middle East and India. 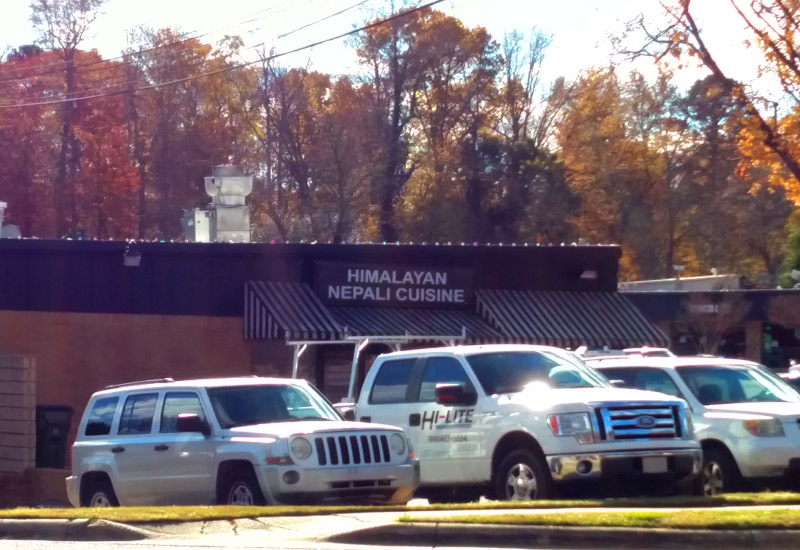 The latter was my craving du jour as I entered Himalayan Nepali Cuisine (not to be confused with Himalayan Range on Maynard) on a chilly, dreary November late afternoon. I wanted warmth, spice and unaffected hospitality, and this is precisely what I received. I was graciously seated in the small, modest but clean establishment, about halfway full of patrons. I was nearly immediately presented with a steamy mug of ginger-lemon tea with honey and small plate of papadum with relish as I perused the menu. The mug warmed my hands and I happily nibbled on the papadum as I made my decisions. I was feeling indulgent, so settled on Gobi Manchurian, (a sweet-spicy crispy cauliflower dish), the vegetable chow chow soup (a creamy, salty broth with mixed vegetables and ramen noodles) and an order of the Peshawari Naan, (a heavenly buttery flatbread that’s basically a dessert; stuffed with raisins, almonds, sugar and coconut). It was the perfect lunch for the chilly conditions. The server and the manager checked in on me several times to express concern that the spice level wasn’t too intense (I ordered it spicy), and to refill my water, but weren’t at all obtrusive as I read my book and peacefully indulged. I’ve dined here numerous times, both seated and take-out, and the experience has been just as pleasant every time. Also try the Momo dumplings, Chicken Tikka Masala, and the Saag Paneer. It’s one of the true gems on E. Chatham, you should check them out next time you’re in the mood for something different. Story by Melodie Alsberg. Photos by Michael Papich.